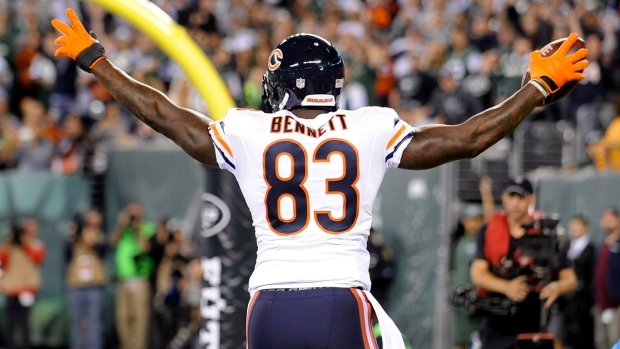 LAKE FOREST, Ill. - Chicago Bears tight end Martellus Bennett is questionable for Sunday's game at Detroit because of a . Coach John Fox says the injury likely happened Thursday. Bennett, second among NFL tight ends with 28 receptions for 233 yards, did not practice Friday. Receivers Alshon Jeffery (hamstring) and Eddie Royal (ankle) are questionable, along with left tackle Jermon Bushrod (shoulder), linebacker Pernell McPhee (shoulder) and defensive lineman Jeremiah Ratliff (ankle). The Bears (2-3) have won two in a row going into the game against the Lions (0-5). They have a bye next week.